Take the hassle out of quartering grapes and tomatoes with the Kitchen Vegetable Fruit Cutter/Slicer. Sharp, serrated, stainless steel blades quickly and easily slice through the soft fruit skin, while keeping fingers safe and out of the way. The blades also cut through pitted olives and grapes and tomatoes with ease. The curved finger rests provide comfort, even during repetitive use. 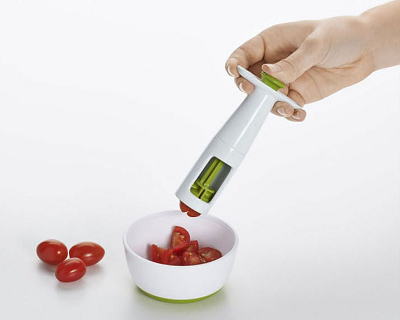 The Grape & Tomato Cutter is great for making chicken salad, sangria, fruit salad, salsa and more. The cover snaps on for safe storage. 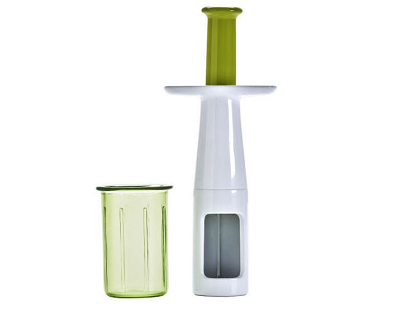 The Grape & Tomato Cutter comes apart for easy cleaning and is top-rack dishwasher safe.